You probably already have a favorite app you use for writing. “Favorite” may be a loose term–you may or may not like it. It could just be the least irritating tool you have. But it’s one you’re used to. It either came loaded on your device, or as part of a larger suite you paid big bucks for or got for free. I want to suggest that you consider paying for a tool that will do the job better for you and save you time and frustration, especially if you work on longer projects. 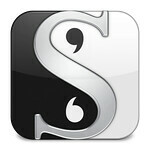 I have been using Scrivener for a couple of years, and I find myself using it for writing just about everything, from books to articles to speaking notes.